Published as: A. Bóta et al., J. Phys. Chem. B, 111 (8), 1911 (2007). The formation of the cadmium sulfide (CdS) particles in the gaps between the stacks of bilayers inside multilamellar vesicles is described illustrating a new pathway in the preparation of nanometer-scale particles. The in situ structural characterization of both the CdS particles and the vesicles as reaction medium was performed in the early and final states of the process by using anomalous small-angle X-ray scattering (ASAXS) and freeze-fracture methods. The ASAXS method provides the separation of the scattering of nanoparticles present in low amount whereby the monitoring of their formation and growth in the whole time range of manufacturing become possible. Fig. 1 (A) The two-dimensional SAXS pattern of the multilamellar dipalmitoylphosphatidylcholine (DPPC)-water vesicles having Cd(NO3)2 (0.05 Cd2+/lipid molar ratio, neutral buffer system, measured at 26120 eV). The broadened single ring is a consequence of a weakly correlated lamellar arrangement. The inset shows the shape of this ring in the representation of the one-dimensional scattering intensity vs. scattering variable, q. Moreover, the difference of two ASAXS (anomalous small-angle X-ray scattering) curves measured at 26120 and 26711 eV is also plotted (blue line). The intense beginning part of this separated form indicates larger domains rich in Cd2+ ions and its broadened peak with reduced intensity corresponds to the diffuse character of the layer arrangement of the vesicles. (B) The surface morphology a giant vesicle broken through, completely. The regular, periodic arrangement of shells is damaged; gaps between the stacks of lamellae appear which are especially visible in the outer leaflets. Significant research interest has turned to nanoparticles due to their unique electric, optical, and mechanical properties which can be employed in great number of applications in different fields extending from computational technology to biological sciences. CdS is one of the most often studied and described semiconductor used in optoelectronic devices, solar cells and environmental protection technologies. Beside several methods the unilamellar vesicles are used to synthesize these particles, using the aqueous core of the quasi spherical vesicles as nanoreactor[1-3]. In this work we have shown that the water shells of multilamellar vesicles may prove to be adequate reaction compartments too, instead of the core of vesicles. The multilamellar vesicles known as model systems of biological cell membranes form spontaneously and they are stable creations thermodynamically, while the unilamellar ones are rather metastable. Consequently, the application of the multilamellar vesicles as nanoreactors insures more extended versatility for both of particle size and shape modification than that of their unilamellar form. 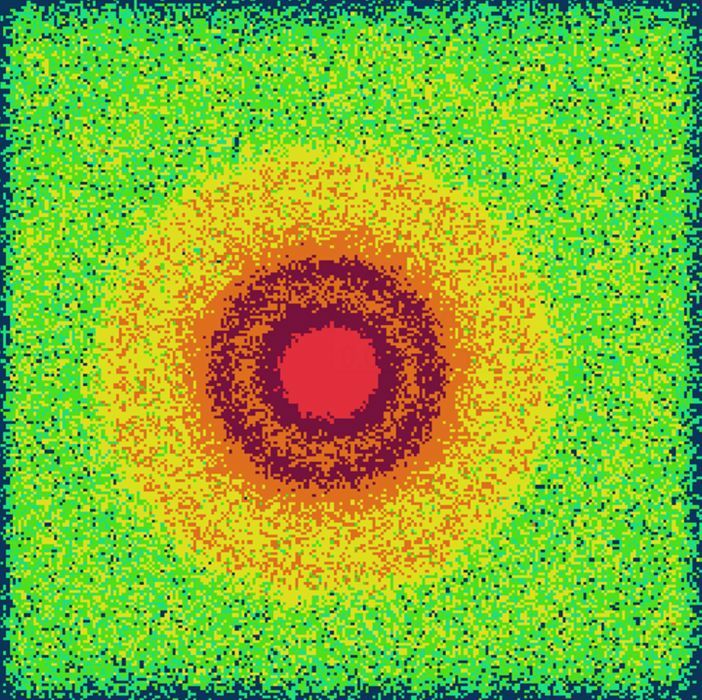 Furthermore, the unique opportunity of the anomalous small-angle X-ray scattering (ASAXS) is presented. This method gives the description of local structures induced by different elements, e.g. Cd ions. The theory of this method is based on the energy dependence of the scattering factors (fCd) of the type of atoms, in our case the cadmium . Performing the ASAXS measurements at three different energies, the determination of the “pure resonant” term (the scattering of the CdS nanoparticles) is possible whereby the characterisation of the nanoparticles can be executed without any separation procedure [5,6]. The fully hydrated DPPC (dipalmitoylphosphatidylcholine)/water vesicles exhibit at least five Bragg rings in their two-dimensional small angle X-ray scattering (SAXS) pattern corresponding to a well ordered multilamellar and macroscopically not oriented structure formed in gel phase at 24°C. The divalent metal ions cause significant destructions in layer arrangement of these vesicles. This phenomenon occurs if the liposomes contained Cd2+ ions. The two-dimensional SAXS pattern shows only one diffuse ring as presented in Fig. 1/A. This character of the SAXS pattern indicates that the lamellarity, the correlation of the bilayers and the bilayer structure itself are severely destroyed. The method requires ASAXS measurements at two different energies at least; at an energy close to the absorption edge and at another one far away from it. These ASAXS curves exhibit great similarity, but the closer inspection reveals that their shapes depend on the energy. The difference in the ASAXS curves measured at the two different energies is characteristic of the structure of the domains having the Cd ions under investigation. Exactly, this difference provides information about the displacement of the Cd ions. The closer the X-ray energy is to the cadmium absorption edge, the smaller is the intensity. The separated form is due to the contrast variation resulting from the change in energy and its shape, shown in Fig 1/A, exhibits an inhomogeneous distribution of Cd ions. It extends up to 5 % in the beginner part of the curve and vanishes at the scattering variable of about 0.05 1/Å indicating the formation of domains rich in Cd ions with a characteristic size in the range of several hundred Å-s. Moreover, the appearance of the diffuse peak in the separated curves indicates that Cd ions are only partly located in periodical shell forms corresponding to the diffuse layer arrangement of the destroyed liposomes. 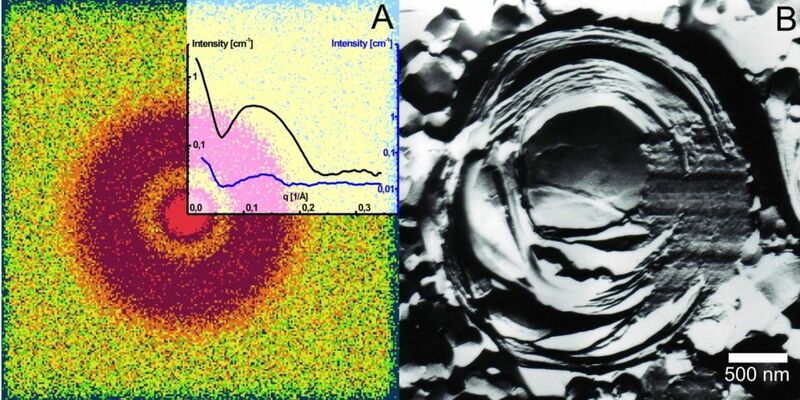 An independent method, the freeze-fracture can reveal the defects of the centrosymmetrical lamellar arrangement of the vesicle, as during this procedure the actual morphology of the soft material is fixed by a rapid freezing and a subsequent shadowing by platinum . In Fig. 1/B a vesicle completely broken through is shown and its cross section exhibits a significant irregularity between the lamellae. Some stacks of lamellae are crumpled and gaps are visible between them which may terminate the long range periodicity. Fig. 2 (A) The two-dimensional SAXS pattern of the multilamellar DPPC-water vesicles having CdS nanoparticles. The Bragg reflections appeared in three orders are unambiguous signs of the reconstructed multilamellar arrangement. The inset exhibits the corresponding one-dimensional scattering intensity vs. scattering variable,q. (B) The fractured surface of the inert part of a giant vesicle broken through, completely. Two types of the characteristic morphologies can be recognized; the regular, periodic multilamellar arrangement in the outer leaflets and great number of CdS nanoparticles embedded between the stacks of lamellae. Adding (NH4)2S to the system the two-dimensional SAXS pattern is drastically changed, shown in Fig. 2/A. Three rings of the Bragg reflections appeared indicating a significant reconstruction of the ordered vesicle structure. Presumably, the collapse of gaps filled with Cd ions occurs during the formation of compact CdS particles. The position of the first reflection corresponds to the periodicity of 65.1 Å, which is slightly longer than that (64.2 Å) of the pure DPPC/water system. The electronmicrograph of a characteristic vesicle is presented in Fig. 2/B in which we can observe the closely packed parallel layers in the outer leaflets as the sign of a rearrangement of a more regular layer structure explaining the increased number of the Bragg rings. What is even more interesting, many small particles appear concentrated in certain layers between the stacks of lamellae. The characteristic size of these particles falls into the range of approximately 5 - 10 nm-s. 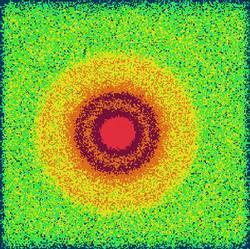 The anomalous scattering provides more structural information about these nanoparticles. To eliminate the contribution of the scattering of the vesicles, the measurements were performed at three different energies, so we could obtain the “pure resonant” term. From this term a characteristic average diameter of 6.9 Å was derived by assumption a log-normal size distribution of a spherical form, presented in Fig 3/A. The characteristic size shows a very good agreement with the estimation of the freeze-fracture method. Finally, the CdS nanoparticles were separated from the vesicle system. Transmission electronmicroscopy was used to elucidate the morphology and size analyze of the single nanoparticles (Fig. 3/B). In the electronmicrograph monodisperse, less spherical, but rather squared stocky shaped particles appear and their sizes (6 - 7 nm) fall exactly into the range of that deduced by the freeze-fracture electronmicroscopy and more precisely by the ASAXS method. The application of the ASAXS technique proved to be a useful tool not only to determine but also to follow the formation of nanoparticles during their synthesis. Moreover, the ASAXS studies provide the observation of nanoparticles without any separation. This advantage of the tunable synchrotron radiation may open further new perspectives in nanotechnology. Fig. 3 (A) The log-normal size distribution of the CdS nanoparticles calculated from the pure resonant term. (B) Typical TEM image of the CdS nanoparticles. The inset (represents a length scale of 10 nm) shows a single CdS nanoparticle. We are grateful to T. Kiss and to Gy. Radnóczi (Research Institute for Technical Physics and Materials Science, Budapest, Hungary) for the electronmicroscopical investigation of CdS particles. This work was supported by the Contract RII3-CT-2004-506008 of the European Community at DESY/HASYLAB (Hamburg, Germany) and by the Hungarian Scientific Funds OTKA (Bóta, T 43055). Y.-M. Tricot, J.H. Fendler, J. Phys. Chem. 90, 3369 (1986). B.A. Korgel, H.G. Monbouquette, Langmuir 16, 3588 (2000). H.B. Stuhrmann, Adv. Polym. Sci. 67, 123 (1985). G. Goerigk, R. Schweins, K. Huber, M. Ballauff, Europhysisc Letters 66, 331 (2004). H.-G.Haubold, K. Gruenhagen, M. Wagener, H. Jungbluth, H. Heer, A. Pfeil, H. Rongen, G. Brandenburg, R. Moeller, J. Matzerath, P. Hiller, H. Halling, Rev. Sci. Instrum. 60, 1943 (1989). H.W. Meyer, W. Richter, Micron 32, 615 (2001).